Alstroemeria is a genus native to South America from which many varieties of ornamental plants have been developed and introduced into the market. Interspecific hybridization followed by embryo rescue has been one of the most common breeding techniques to obtain new varieties. This study was aimed at obtaining alstroemeria hybrids through interspecific crosses using novel scented parental lines and assessing these hybrids. A total of 3669 embryos were rescued, from which 18 flowering plants were morphologically evaluated. Flower stem length ranged from 25 (14E07) to 83 cm (14A11) and most of the flowers showed pink/white colors with stripes over the inner tepals. Only 3 hybrids were perceived as scented and one of them (14E08) was evaluated through GC-MS analysis, detecting 9 VOCs, all of them monoterpenes. 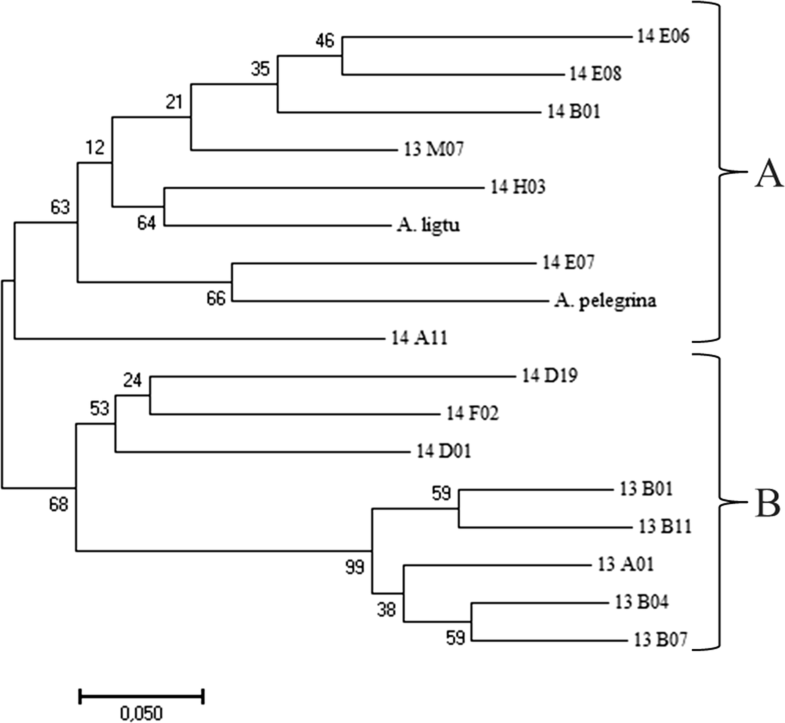 Molecular analysis using RAPD markers clustered two main groups: (A) hybrids with A. pelegrina as parental line and (B) hybrids coming from the crossing UC05 × C3 and its reciprocal. Moreover through this analysis was possible to subcluster hybrids coming from different seasons. 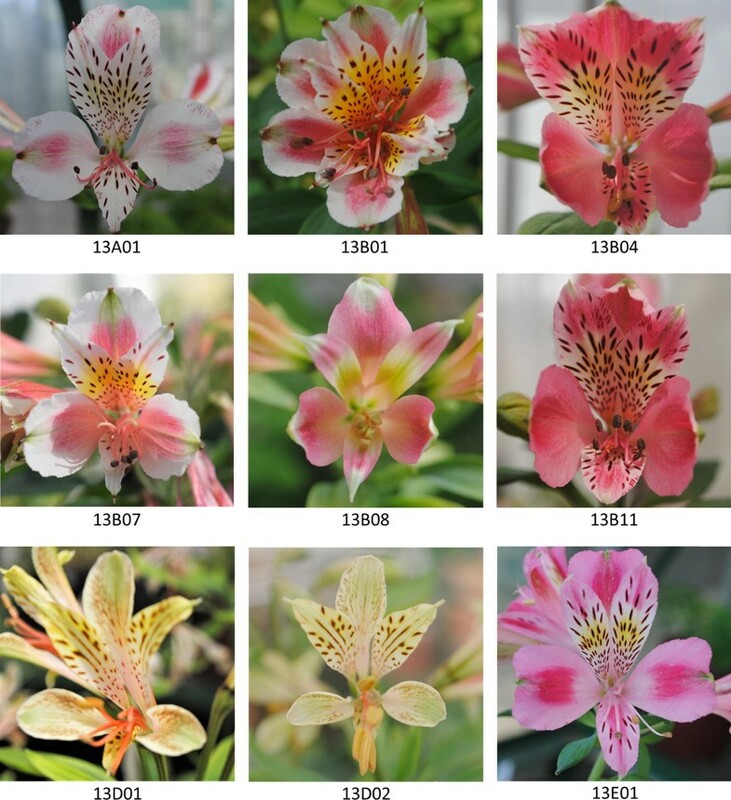 A protocol for obtaining alstroemeria hybrids was successfully developed for this species using molecular and phenotypic evaluation to provide information about their pedigree and to spot those traits which are attractive for the ornamental plant market. Alstroemeria is a genus native to South America with about 60 described species, most of them native to Chile and Brazil which are the main diversity centres of this genus (Bayer 1987; Muñoz and Moreira 2003). Alstroemeria are herbaceous, perennial and rhizomatous plants with large and attractive flowers, growing in a wide range of habitats across the Andes Mountains and the rainforests in Brazil (de Assis 2004). Alstroemeria has been very engaging for ornamental plant breeders considering its attractive flowers, and many commercial cultivars have been successfully introduced in the market, using this species as cut flower and more recently as a potted plant and as a garden flower (Bridgen 2018). Nowadays, alstroemeria is one of the most important cut flowers in the world market (Lim et al. 2012) and many new varieties are released every year. Several techniques have been applied to obtain new varieties and studies focused on the induction of mutagenesis using gamma (Aros et al. 2012) and X rays (Anastassopoulos and Keil 1996), polyploidization (Lu and Bridgen 1996; Bridgen et al. 2009) and lately transformation (Akutsu et al. 2004) have been carried out. However the most popular technique for the development of new varieties has been interspecific hybridization with subsequent in vitro embryo rescue (Burchi et al. 1998; Kamstra et al. 1999; De Benedetti et al. 2000; Bridgen et al. 2009). The first alstroemeria hybrids were obtained through the interspecific hybridization between two Chilean species (Alstroemeria aurea R. Graham × Alstroemeria violacea Phil.) (Vonk Noordegraaf 1981). Some attempts were made to obtain hybrid plants between Chilean and Brazilian species which were unsuccessful because of embryo abortion produced by the incompatibility between these species (De Jeu et al. 1992). In De Jeu and Jabosen (1995) discovered that post fertilization barriers were the main limitation when hybridizing alstroemerias, and therefore embryo rescue before abortion was the solution to obtain seedlings coming from interspecific crosses, particularly from taxonomically distant species. Nowadays this technique has been widely developed and used to perform successful crosses and several hybrids have been described coming from hybridization between several Brazilian (i.e. A. inodora, A. psittacina) and Chilean species (i.e. A. aurea, A. pelegrina, A. magnifica, A. angustifolia, A. diluta, A. garaventae, A. hookeri, A. ligtu, A. magenta, A. presliana, A. pulchra, A. versicolor, A. zoellneri) (Hoshino 2008). In order to perform this process more efficiently, some studies have been focused on optimizing the conditions for a successful in vitro embryo rescue, evaluating the culture medium and embryo developmental stage at the moment of the rescue (Buitendijk et al. 1995; Lu and Bridgen 1996). 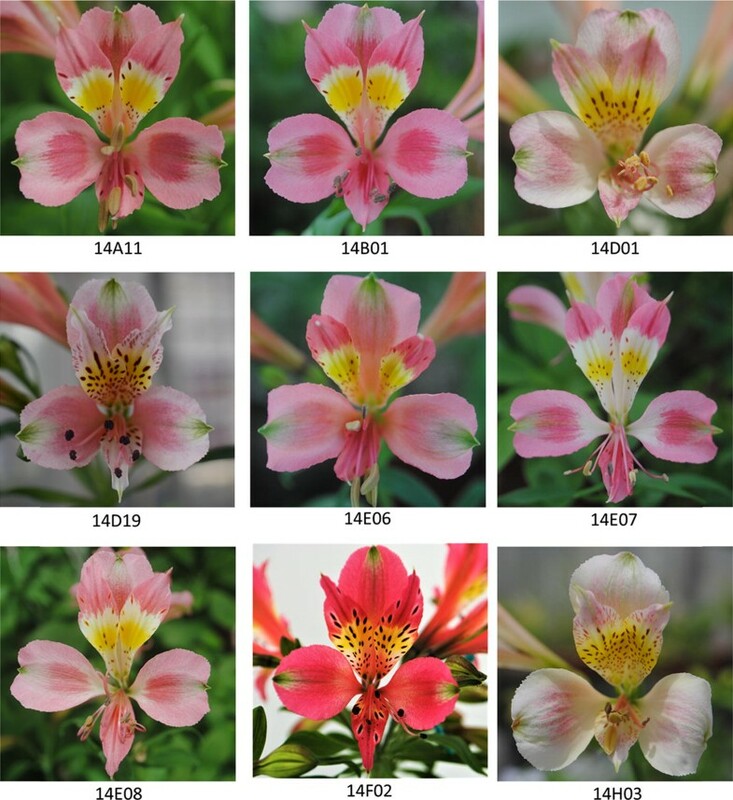 The ornamental value of new hybrids of alstroemeria has been usually assessed using morphological descriptors considering flower size and color, stem length (Aros et al. 2015) and vase life (Leverentz et al. 2002), which are the main characters chosen by ornamental plant breeders. Molecular characterization of different species (Kuipers et al. 2002) and cultivars of alstroemeria (Dubouzet et al. 1997) has also been performed. Although an important character, well appreciated by consumers (Aros et al. 2015), floral scent has been poorly studied in this species. So far Alstroemeria caryophyalleae, a species endemic to Brazil, is the only scented species described within the genus (de Assis 2004) but little is known about the heredity of this character. Apparently floral scent has been unintentionally selected against by breeders considering a putative negative association between vase life length and fragrance (Porat et al. 1993). GC-MS studies have identified terpenoid as the major volatile compounds emitted by flowers of alstroemeria and sensorial studies have assessed this scent between 6 and 7 in a liking scale (1 to 9) (Aros et al. 2012, 2015). Furthermore some molecular studies have identified an alstroemeria terpene synthase (ALSTER) responsible of the production of the monoterpene myrcene (Aros and Rogers 2012). Although modern varieties of alstroemeria have been obtained by the hybridization of several Chilean and Brazilian species, the genetic background of these cultivars still seems to be narrow, as described by Aros et al. (2006) using both molecular and morphological markers. Probably this condition has been promoted by breeders who have been focused only in certain specific traits (i.e. flower size, stem length and vase life). Thus this study was aimed at obtaining alstroemeria hybrids through interspecific crosses using novel scented parental lines (segregating lines coming from the Brazilian species A. caryophylleae) and assessing of these hybrids through phenotypic (morphology and floral scent) and molecular characterization. Interspecific crosses were made using 7 alstroemeria genotypes including the alstroemeria hybrids ‘C3’, ‘A102’ and ‘Red Coat’; the native species A. pelegrina, and the scented A. caryophyllaea segregant lines ‘UC05’, ‘0205’ and ‘0276-02’. All these genotypes were grown in individual pots, under glasshouse conditions at the Long Island Horticultural Research & Extension Center (LIHREC), Cornell University (Riverhead, NY, USA). Interespecific crosses were performed during the seasons 2013 to 2016. The first two seasons (2013 and 2014) were performed at Long Island Horticultural Research & Extension Center, Cornell University (Riverhead, NY, USA) and the following two seasons (2015 and 2016) were performed at the Faculty of Agricultural Sciences (FAC), University of Chile (UCH). Hybridization was performed through manual pollinations between the genotypes previously described (Fig. 1a). Pollinations were performed using fresh dehiscent anthers; considering the protandric condition exhibited by these species, eventually pollen was collected from mature anthers and stored (4 °C) to perform pollination during the following 1 or 2 days. After 12 to 14 days post pollination, fruits were harvested (Fig. 1b) and disinfected at the Tissue Culture Laboratory by direct flaming them with ethanol (95%) for 5 s. Fruits were dissected and cut into halves (Fig. 1c) and the embryos were rescued and sow in Petri dishes (15 × 60 mm) containing 20 ml of ½ strength Murashige and Skoog (1962) medium, supplemented with 30 g sucrose l−1, 7 g agar l−1 and a pH adjusted to 5.7 (Fig. 1d, e). The Petri dishes were maintained under complete darkness in a growth room at 24 ± 1 °C until germination (8 to 12 weeks). Germinated embryos showing one or more shoots were cultured in glass culture tubes (150 × 30 mm) containing 15 ml of MS medium supplemented with 30 g sucrose l−1, 7 g agar l−1 and a pH adjusted to 5.7, and were transferred to a growth room under 21 ± 1 °C and a 16 h photoperiod. After formation of rhizomes, plants were subcultured into 200 ml flasks containing 45 ml of MS medium supplemented with 30 g sucrose l−1, 7 g agar l−1 and 2 mg 6-Benzylaminopurine l−1 (BAP) to promote shoot growth (Fig. 1f). Plants were sub- cultured every 3–4 weeks and transferred to fresh media, keeping the same conditions described above, until a minimum of three clones were obtained. One of the clones was transferred to 300 ml-magenta containers with 20 ml liquid MS medium supplemented with 30 g sucrose l−1, and 1 mg Indole-3-butyric acid l−1 (IBA) to promote rooting. Rooted plants were placed into plastic pots (400 ml) containing a substrate mixture of 60% peat moss and 40% perlite. Another clear plastic container was placed and initially sealed over the plastic pot, to start opening gradually every 3–4 days until the containers with plants were completely discovered (Fig. 1g). After 3 weeks plants were transferred to larger pots (3 l), containing the same mixture of substrate mentioned before, and moved to a greenhouse to complete acclimation at growing conditions of 15 to 25 °C and > 40% HR (Fig. 1h). In vitro culture and acclimation of hybrids was conducted, for all the crosses performed (2013–2016), at the Facilities of the FAC, University of Chile (Santiago, Chile, 33°34′11″S 70°37′50″O). Characterization of morphological traits was conducted under greenhouse conditions and also at the stage of anthesis. The characteristics considered were: stem length (Measured from soil level to the end of the upper flower in cm) and firmness (1 to 5, according to Aros et al. 2015), number of flowers, size of the flowers (average diameter in mm), color of the internal and external tepals, visual evaluation using a RHS mini color chart (The Royal Horticultural Society & Flower Council Holland, London, UK), and abundancy and position of the colored stripes present on the tepals. For the evaluation of the floral scent, the hybrid 14 E08 was selected, because of its consistency and strength of the scent emitted. One single flower was collected at stage of development 4 or 5 (according to Wagstaff et al. 2001) and enclosed into 300-ml glass jars with 30 ml of distilled water for 30 min. A 50/30 μm Divinylbenzene/Carboxen/Polydimethylsiloxane (DVB/CAR/PDMS) coating SPME silica fibre (StableFlex fiber, Sigma-Aldrich, Gillingham, UK) was exposed inside the flasks for 30 min to collect the volatile organic compounds (VOCs) from the headspace of the flowers. Then the fibre was injected for 2 min into the injection port of the GC machine (GC 8000) set at 240 °C. VOCs were separated using a 30 m, 0.25 mm ID capillary column over 0.25 m HP-5MS (Agilent) following the thermal programme: GC analysis was continued for 52 min with the following thermal profile: initial temperature 40 °C for 5 min, first step increase 6 °C min−1 to 80 °C, holding this temperature for 5 min, second step increase 4 °C min−1 up to 170º C. Mass spectrometry analysis was carried out in a Finnigan MD 800 (Finnigan, Manchester, UK.) with full scan between 35.00 and 500.00 M/z and using electron impact in positive mode (EI +). A solution of 4-methyl-2-pentanol in ethanol was used as an internal standard and for calculation of retention (Kovats) indices a solution of alkanes (C7–C30) was injected in the same conditions as described for the samples. The peaks displayed in the chromatograms were analysed through Masslab Software. Identification was performed by comparing mass spectra of each compound with the NIST Library (ver. 1.2.) and comparing with the Kovats index found in the literature and flavornet (Milos et al. 2001; www.flavornet.org). A total of three biological replicates were performed, quantification of relative areas and standard deviation for each replicate was calculated. DNA was extracted from 0.1 g of fresh leaves, following the CTAB protocol described by Aros et al. (2006). To confirm quality and estimate quantity of DNA, absorbance of each sample was calculated at 260 nm (A260) and 280 nm (A280) using a ND-1000 UV–Vis NanoDrop (Wilmington, USA). Samples with a value of A260/280 nm (A280) over 1.71 were suitable for further PCR amplification as described by Dubouzet et al. (1997). The PCR reaction was carried out in a 10 μL mix containing 20 mM Tris-HCl (pH 8.4), 50 mM KCl, 4.0 mM MgCl2, 0.8 mM dNTP mix, 0.5 mM primer, 1.25 U AmpliTaq DNA polymerase (Invitro-gen), 4.15 mL de-ionized water and 25 ng DNA extract. According to previous results described by Aros et al. (2006) the following primers were used: OPA 04 (5′-AATCGGGCTG-3′), OPA 08 (5′-GTGACGTAGG-3′), OPB 05 (5′-TGCGCCCTTC-3′), OPB 07 (5′-GGTGACGCAG-3′), OPF 05 (5′-CCGAATTCCC-3′), OPF 08 (5′-GGGATATCGG-3′), OPF 14 (5′-TGCTGCAGGT-3′) and OPF 17 (5′-AACCCGGGAA-3′) (Operon Industries, USA). Thermal cycling was performed using a Life ECO TC-96/G/H (BIOER, China) as follow: 3 cycles of 60 s at 95 °C, 60 s at 37 °C and 80 s at 72 °C; 37 cycles of 35 s at 94 °C, 40 s at 40 °C and 80 s at 72 °C; and one final cycle of 7 min at 72 °C. Amplification products were analyzed by electrophoresis on 1.5% agarose gels for 3 h at 100 V and then visualized by GelRed™ staining. RAPD fragments were photographed using a photodocumentation system SC750 (BIOTOP, China). Photographs were analyzed using BioSens Gel Imaging System, Version 2.0 (Bio-Tech). The most consistent clear and reproducible bands were considered for the analysis. Consistent and reproducible bands were scored to create a distance matrix based on Neighbour-Joining (NJ) algorithm to calculate phylogenetic distance using arithmetic averages (Saitou and Nei 1987) and the bootstrap method repeated 1000 times (Felsenstein 1985; Nei and Kumar 2000). Data analysis was performed using the software MEGA7 (Kumar et al. 2016). The number of alleles was determined per locus through an estimated frequency. Effectiveness of the RAPD markers was based on the following parameters: Diversity index (DI) (Weber 1990), Probability of identity (PI) (Paetkau et al. 1995) and Polymorphic information content (PIC) (Weber 1990). where Pi and Pj are the frequency of the ith and jth allele. These indexes (DI, PI and PIC) ranged from 0 to 1 and provide information about effectiveness of RAPD markers to discriminate among genotypes analyzed. A total of 262 crosses were performed over four years of study, from which 3669 embryos were rescued giving an average between 13 (2016) and 15 (2013) embryos per cross. From the total of embryos rescued (3669) during the four seasons of study, 1361 embryos showed germination, with a % of germination ranging between 14.3 (2013) and 54.3 (2015). Finally, 55 plants have been acclimated from which 23 have shown flowering from crosses performed during 2013 and 2014, therefore this study and the results presented are based on the evaluation of these hybrids (Table 1). The morphological characterization was performed at flowering stage and only hybrids with enough numbers of flowers (> 3) were considered for this evaluation. Thus 8 hybrids from 2013 (Fig. 2) and 9 hybrids from 2014 (Fig. 3) were characterized. The size of the flowers ranged from 27.2 (13D01) up to 60.4 (14E08) mm and their color was variable, showing different combinations of pink and white tones as the parental lines ‘C3’ and A. pelegrina, except from 13D01 and 13D02 which showed yellow tones as these came from self-pollination of the A. caryophylleae segregating line ‘UC05’. Moreover a yellow band, at different intensity and width, crossing the upper internal tepals, was observed in all the hybrids (Figs. 2, 3). Most of the hybrids showed stripes over the inner tepals, except from 13D01 (stripes over the external tepals) and 13B08 (no stripes). Flower stem length ranged from 31.0 (13B08) up to 63.6 cm (13B11) for season 2013 and 25 (14E07) up to 83 cm (14A11) for season 2014 (Table 2). The differences expressed in terms of tepal color for the hybrid plants in this study are minor considering that almost all the hybrids showed pink tepals and only two of them showed white tepals. Heredity of color has been well described in several species, including ornamental plants such as chrysanthemum (Lema-Rumińska and Zalewska 2005) and roses (Gitonga et al. 2009). Flower color polymorphism is due to variation in floral pigments, particularly anthocyanins and a predominance of pink, purple and blue with white combinations has been described as the result of changes and single mutations in the anthocyanin pathway (Richards 1986). In our study, orange and red colors were lost after hybridization probably due to changes in the biosynthesis pathway of anthocyanins and/or carotenoids, which responsible for those colours in flowers (Berman et al. 2016), confirming the high polymorphism previously observed in other species. Warren and Mackenzie (2001) have considered that flower color is also regulated by selection related to environmental heterogeneity and stress tolerance. From the point of view of ornamental plant breeding, a wide diversity of colours is necessary as this character is essential for the consumers as shown by Aros et al. (2015). Considering stem length, all the hybrids were short (< 83 cm) compared to commercial varieties of cut flowers released by breeding companies, where normally the stem length range between 100 and 160 cm (Könst 2017). The short nature of these hybrids allow them to be considered as potted plants for the commercial market, particularly those hybrids with the shortest stem length (about 30 cm). Commercial varieties of potted alstroemerias show stem length between 20 and 35 cm (Royal Van Zanten 2017). Through sensorial analysis only 3 hybrids (14B01, 14E07 and 14E08) and 2 genotypes coming from self-pollination (13D01, 13D02) were perceived as scented (Table 2). Considering its consistency and strength, the floral scent of the hybrid 14E08 was chosen to be evaluated through GC-MS. The analysis performed detected a total of 9 VOC’s, all of them monoterpenes. Considering relative areas, the major volatile compounds were the monoterpene E-β-ocimene (2437) and the cyclic monoterpene eucalyptol (150) (Table 3). Floral scent of the hybrid 14E08 was composed exclusively by terpenoid compounds, and clearly dominated by cyclic monoterpenes (6 out of 9 of the VOC’s detected). Terpenoid compounds have been described as the largest group of plant natural products, showing different structures and presenting important ecological roles in the nature (Degenhardt et al. 2009), mainly as pollinator attractors (Schiestl 2010). Moreover, terpenoid compounds, and particularly monoterpenes, have been detected as part of the floral scent bouquet of many species (Knudsen et al. 2006) and particularly in commercial important species such as lily (Kong et al. 2012) and daffodils (Ruíz-Ramón et al. 2014). Monoterpenes detected in 14E08 such as pinene and ocimene (and its isomers) have been described to have a very low perception threshold (Tamura et al. 2001), which means they are easily perceived and therefore play and important role in the floral scent. The major VOC detected in the hybrid 14E08 was the monoterpene E-β-ocimene (Relative area = 6.767 ± 1.133), which was previously described by Aros et al. (2015) as the major compound detected in the floral scent of A. caryophyllaea. Considering that the hybrid 14E08 is coming from an A. caryophyllaea segregant as a parental line, it is not surprising to find the same monoterpene as the major volatile compound. 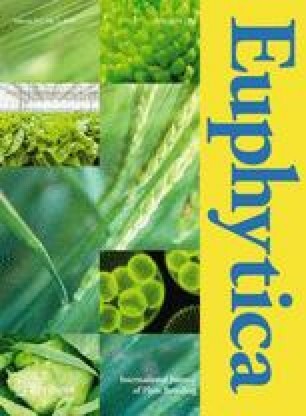 However previous studies with Alstroemeria ‘Sweet Laura’, a hybrid coming also from A. caryophyllaea, showed only the sesquiterpene caryophyllene as the major volatile compound detected and no presence of β-ocimene (Aros et al. 2012). Eucalyptol was the second major compound detected in the floral scent of the hybrid 14E08 (Relative area = 1.712 ± 0.192) and this monoterpene has been also identified as a major compound in the floral scent of species such as tulips (Oyama-Okubo and Tsuji 2013) and chrysanthemum (Sun et al. 2015). Both E-β-ocimene and eucalyptol have been described as ‘green’ or ‘herbaceous’ odors and are not particularly related to ‘fruity’, ‘sweet’ or ‘floral’ scents, commonly perceived in flowers. It is possible that other VOC’s present with lower relative area (i.e. Z-ocimene, terpinolene) are more highly perceived by the odor receptors present in our nose (Zarzo 2007) or perhaps our sense of smell perceived this floral scent as a bouquet including both major compounds (β-ocimene and eucalyptol) together with other VOC’s. Amplification of DNA fragments using RAPD primers produced bands of different size, ranging from 211 (OPA4) to 1882 bp (OPF14). Effectiveness of these RAPD markers was assessed using different parameters, previously described in the methodology section. Thus average values of 0.327 and 0.412 was observed for PIC and DI, respectively, which are below 0.5 and therefore sufficiently informative. PI average value was 0.603, which is suitable for the analysis of genetic diversity proposed in this section of this study (Table 4). Through the distance matrix based on Neighbor-Joining (NJ) algorithm, two main groups were observed. One group (A) clustered mainly hybrids coming from crosses using A. pelegrina (13M07, 14B01, 14E06, 14E07, 14E08) as parental line, while the other group (B) was conformed exclusively by hybrids coming from the cross UC05 × C3 (13B01, 13B07, 13B11, 14D01, 14D19) and its reciprocal C3 × UC05 (13A01, 13B04, 14F02). Furthermore within each group it is possible to sub cluster hybrids coming from crosses performed in 2013 (i.e. 13A01, 13B01, 13B04, 13B07 and 13B11 within group B) and 2014 (i.e. 14D01, 14D19 and 14F02, within group B) (Fig. 4). For example 13A01 and 14F02 are coming from the same cross but performed in different seasons (2013 and 2014, respectively), and they show higher distance between them compared to hybrids coming from different parental lines but from the same season. Evaluation of genetic diversity using RAPD markers among genotypes of alstroemeria has been previously reported, including commercial varieties (Anastassopoulos and Keil 1996; Dubouzet et al. 1997) and native species (Baeza et al. 2007). Furthermore, Aros et al. (2006) combined molecular markers and morphological descriptors to assess genetic diversity within this genus. In this study, RAPD markers were able to discriminate between hybrids coming from different parents and from different seasons, which could be useful to assess and classify larger populations produced in a breeding program of alstroemeria. Moreover, RAPD markers could be used to confirm hybridity in interspecific crosses of alstroemeria (De Benedetti et al. 2000). A protocol for obtaining alstroemeria hybrids through crosspollination and in vitro embryo rescue was successfully developed for this species. Moreover, molecular and phenotypic evaluation of these hybrids was able to provide information about their pedigree and to spot those traits which are attractive for the ornamental plant market. This research was funded by FONDECYT Initiation into Research No. 11130325, Government of Chile.